There is a reason why the United States Supreme Court rarely hears child custody issues: the length of time that it takes for a case to go through the various lower courts, effectively leaving a decision concerning “the best interests of the child” in limbo for the duration of the process, is not the way family law matters are intended to be resolved. Parents disputing child custody issues often lose sight of one of the most important issues – settling the matter as quickly as possible so that children are not dragged through the process for an indefinite period of time. If you have child custody concerns, it is important to contact an experienced San Diego family law attorney as early as possible. Disputing parents want to protect their rights to live with and take care of their children. In the instant case, U.S. Army Sergeant Jeffrey Chafin, and his wife, Lynne Chafin, a Scottish Nationalist, were married in Germany in 2006. In 2007, their daughter was born, Sergeant Chafin was deployed to Afghanistan, and Ms. Chafin brought their child to Scotland. In 2010, Sergeant Chafin was transferred to Alabama and Ms. Chafin and their daughter met him there. Shortly thereafter, Mr. Chafin filed for divorce and child custody in Alabama state court. Ms. Chafin started this action in a federal district court in Alabama, and filed a petition under the Hague Convention (which is designed to return children illegally taken from member countries) seeking an order for her daughter’s return to Scotland. As reported in an earlier blog post, the district court agreed with Lynne Chafin’s argument that Scotland is their habitual residence. Once the father’s motion to stay the decision was denied, mother and daughter returned to Scotland. The 11th Circuit Court of Appeals dismissed Sergeant Chafin’s appeal as moot, because the child was already brought back to Scotland. In declaring the issue moot, the Court had no authority to render a decision on the merits of the case and essentially handed over jurisdiction to the Scottish courts. Sergeant Chafin petitioned the U.S. Supreme Court to hear his appeal of the 11th Circuit decision. The U.S. Supreme Court agreed to hear the matter and unanimously reversed the decision holding that the 11th Circuit should have heard the merits of Sergeant Chafin’s appeal. The Court ruled that an appeal of an order under the Hague Convention is not rendered moot, simply because the child has been returned to a foreign country. According to the Court, a suit becomes moot if issues presented in a case are no longer “live,” or if it is impossible for a court to grant meaningful relief to the prevailing party, among other things. A case cannot be considered moot where the parties maintain a “concrete interest” in the result of the action. The Court found that the dispute was still “alive” — noting that the parties are still strongly contesting the country where their daughter should be raised. As for whether the decision will be effectual, the Court noted that even if Scotland fails to comply with a re-return order, the case is still not moot. U.S. courts continue to have personal jurisdiction over Ms. Chafin and may order her to return under threat of sanctions. This decision strengthens the rights of all American parents (including those residing in California), in child custody battles with parents who are foreign nationals. If you have questions about a child custody matter, you are encouraged to contact Doppelt and Forney, APLC . Mr. Doppelt is a knowledgeable family law attorney with more than 20 years of experience representing parents in Southern California. Doppelt and Forney, APLC serves clients in Encinitas, Linda Vista, San Diego, and Scripps Ranch. 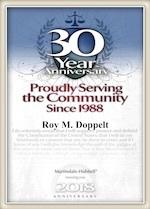 For a free consultation with an experienced and dedicated family lawyer, contact Doppelt and Forney, APLC through the law firm’s website or give us a call toll-free at (800) ROY IS IT (769-4748).